A grower may have a very high yield in a particular field, but not be able to sell a high percent of the crop. Vegetables must meet the standards required by the industry, and demanded by consumers across the country. A uniform, nicely shaped product is usually a must. To get the highest percentage of your crop to meet these standards, precisely planting seed in the soil with the desired amount of space between each seed is critical. 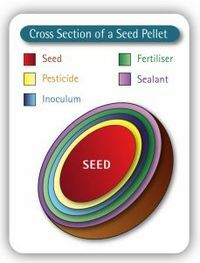 Seed pelleting can increase the likelihood that the seed will be placed in the soil with the most precision and accuracy possible. 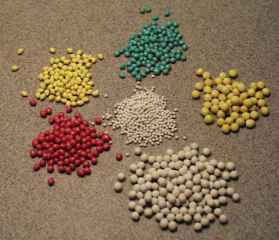 The idea behind seed pelleting is to take a seed that is comparatively light in density and oddly shaped and turn it into a seed with a pellet around it that makes that seed heavier, more uniform, and as perfectly round as possible. A planter will be able to plant that seed/pellet in the most accurate and precise way that is mechanically possible. Creating a pellet is both a science and an art. Most of the science comes when selecting the powders and adhesive used to create the pellet around the seed. The materials should form a pellet structure that is porous enough to provide immediate oxygen to the germinating seed, and absorb water in a way that is most beneficial to the seed. It is necessary sometimes to have a mixture of 4 or more powders in order to achieve the desired characteristics and also end up with the desired pellet density. The adhesive is also very important. It needs to be strong enough to hold the powder together, without making the pellet so hard that it slows the germination process. You can also go one step further by putting together the right combination of adhesives and powders to create a pellet that actually splits open much like an egg cracks open. This splitting action is said to lead to even faster oxygen availability and thus less stress on the germinating seed. There are a couple of ways to create a pellet around a seed, but today the most common method was taken from the candy industry. 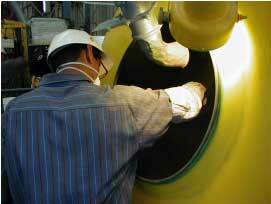 In this method, seed is placed in a large rolling pan like the one pictured below. The pan is continuously turning and tumbling the seed during this process. The pelleter sprays water until the seed surface is wet. After that, he sprinkles the pelleting powder over the wet, tumbling seed. The powder sticks to the wet seed. The pelleter then sprays adhesive until the seed and powder is again wet. Then more powder, then more adhesive, then powder, then adhesive etc. etc. etc. During the process the pellets are removed from the rolling pan several times in order to run them over a sizing screen so that smaller pellets can be built up, while any larger pellets wait outside the pan. This is done until all pellets are exactly the same standard size. Knowing when and how much adhesive to add, and when and how much powder to add is an art that takes some time and practice to perfect. Several companies are starting to use machinery that is more mechanized, using less art, but the method described is still the most common pelleting method used in the industry today.